The issue of justice is one of ethics and is basically founded on the human sense of fairness. It is something desired in every act or circumstance that respects the value of meaningful life both human and non-human. Justice is the very principle that sustains the condition of existence in its spontaneous flow towards higher and greater levels of refinement. It is supposed to be the fundamental standard that bestows dignity to humanity. As such, human dignity is inalienable, inviolable, and thus, non-negotiable on the basis of the moral principle of justice. Justice promotes human flourishing which in a more comprehensive sense ties up and connects with ecological flourishing without which human flourishing doesn’t make sense at all. If ever there is a summum bonum or the highest good of morality, justice should stand as the uncontested beacon that gives direction to a more reasonable and proper understanding of the virtues of compassion, courage, freedom, honesty, humility and responsibility, among others. In the light of justice, these virtues transcend their theoretical configurations and hence take their respective concrete forms of pragmatic expression in actual Sitz-im-Lebens. Justice, therefore, gives credence to and protects the essences of these virtues. From such condition, justice itself draws its legitimacy as a supreme virtue that in turn should likewise be protected by the human agents who uphold and value it over and above the others. Justice–as it is represented by the blindfolded woman holding up a weighing scale at the façades of halls of justice and supreme courts–is impartial and does not subjectively look at the superficial aspects of persons, things and events. The weighing scale definitely represents the analytical character of justice with the “syllogistic” potency of a cold logic that takes its ethical signification as the major premise: “If x then y. And x. Therefore, y.” Or, “If x then y. And not y. Therefore, not x.” In other words, the “logic of justice” takes the same rational path trodden by a logical argument where something meaningful has to be proven (technically, the conclusion of a formal logical argument) through an orderly presentation of reliable evidences (technically, premises in a formal logical argument). As in the application of the formal logical procedure in true-to-life circumstances, the full satisfaction of the “logic of justice” is not simply hitched on an argument’s validity but more on its soundness. All these matters henceforth considered, justice is by and large a virtue that transcends subjective perception. In this connection, there is supposed to be nothing emotional in the process of rendering justice to whom justice is due. Justice, as we have seen its objective configuration, follows a logical trajectory whose premises exactly lead to their inevitable conclusion. The true essence of absolute justice which is devoid of subjective feelings and emotions is re-confirmed in us: “If x then y. And x. Therefore, y”. Or, “If x then y. And not y. Therefore, not x.” With this in mind, not a single matter of feeling or emotion may ever be construed to trigger an act of justice. Having the character of cold logic, the procedural path that leads to justice cannot emanate from a sensation of anger or elation, hatred or affection, sadness or pleasure. 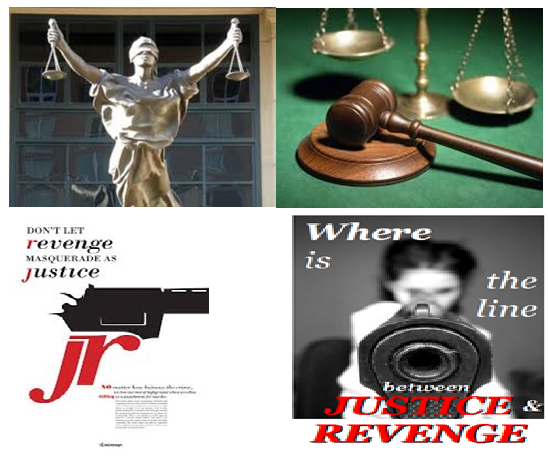 Turning now our attention to the question, “Is justice revenge?”, one important issue to focus on at this point in time is the basic idea that highlights an understanding of revenge. We may start off with the question: Does it emanate from rationality or is it basically a feeling fired up with hatred? In practically all instances, revenge is loaded with a highly aggressive feeling of resentment and loathing. It is characterized by a strong drive to retaliate– and to retaliate viciously–towards a specifically defined adversary. But can revenge draw a supportive push from reason? In certain instances, people would justify the reasonableness of revenge (or vengeance). In the process, a flurry of opinions could be developed as considerable factors that make revenge seemingly reasonable and hence could be construed as an act of justice. But this manner of looking at the issue at hand distorts the logic of justice. The confusion created by putting revenge within the range of justice and vice versa desecrates justice and elevates revenge at the level of the virtuous. This is a case of making a mess out of the ethical landscape where justice is held supreme. Having true rationality at the core of justice, revenge cannot truly emanate from it for the conceptual components of revenge rest on one’s feeling of hatred and abomination. A god acting on the basis of revenge is not a just god. The logic of justice cannot operate in such statement as “Vengeance is mine says the Lord.” However, knowing the theological background that triggers contradictory statements which put the god of believers on the spot does not cast any negative notion about such a god if he really exists for such statements of conviction are only mental formulations of people who have never really known the mind of the god they say they believe in but merely imagined ideas such a god they have conceived would say according to their wishes and desires. A case in point where an act of revenge had been made to appear like an act of justice was in the impeachment trial of the Philippines’ Supreme Court Chief Justice Renato Corona a couple of years ago which was maneuvred by the President of the Philippines himself, Benigno Cojuangco Aquino, III. It was more of an act of revenge than of justice as Aquino had an axe to grind against Corona who had previously approved the Supreme Court’s order to parcel and distribute to farmer-tenants farmlands of the expansive Cojuangco-Aquino`s feudal estate. The impeachment process was conducted by the legislative branch of government to create a semblance of justice. But it was a case of utter railroading for the majority of the legislators were members of the president’s coalition block. More serious than this is the information which very recently leaked through the media exposing that the President himself paid the legislators hundreds of millions of pesos from government funds just to effect the plot of revenge he masterminded against the erstwhile Chief Justice. Justice takes a logical trajectory sans any feeling of hatred or loathing. At the end of the day after justice has been rendered to whom it is due, victims of previous injustice would certainly have a feeling of exhilaration and triumph for in the most superficial sense, their cause has been avenged. But one thing is very clear: they finally achieved the justice they long sought for not on the basis of hatred and revenge but through the “logic of justice” whose major premise is drawn from the “ethics of justice”.